Not surprised at all to hear about your improved casting distance. Drop that line to 25 and you might be able to snag the moon. I have not had the DC Curado apart yet. However, if it's anything like the Calais DC, they call it a microprocessor but it's almost magnetically controlled. The spool spins inside a set of windings. The spool spinning inside the windings generates an input that the minicomputer uses to apply braking power when needed. Pretty cool actually, I don't know anything about the 1's and 0's side of it though. You wont hear a review from me on it. I wont buy one. Not a fan of Shimanos new stuff. Build quality is not to my "Shimano" standards, and hate that they cut corners, and did some things with the design that makes me say "WTF". I personally have no use for a DC reel, and have used and been through quite a few. If I want "casting control" Ill just use the standard brakes and my thumb (if needed), or Ill go the Daiwa Magforce/SV route. Less things to fail. Makes sense I guess, I won’t likely buy another, cause they ain’t exactly cheap, but it is fun to use. Longevity remains to be seen. I can't wait to get my new DC. The Calcutta DC is a much loved and coveted reel. This reel is a game changer. Shame though us lefties have to wait until September to buy our reels. Hurry up shimano. Bassmasstan be proud of your reel, enjoy it and if you find you have the funds, buy another one. Fish what works for you. The tech in this reel is proven, the parts in this reel are also proven. Some just refuse to believe that years of usability isn't good enough. They believe it's going to fall apart one day, it might be ten years from now You already said it cast better and further than your other reels, don't let these guys make you think it's not a worthy reel, it is! LGM I know you think it went cheap (Curado) but it's still out there making casts with no more people complaining about them than they do the Daiwa stuff. I get that you're personally not happy with the builds. I do... and he asked for it, but come on man, Bassmanstan just bought a piece of art, let him enjoy it! 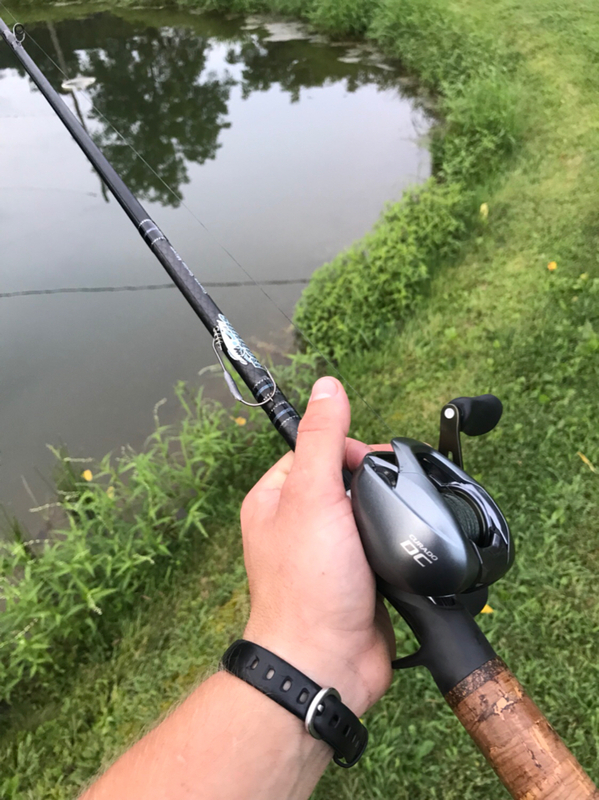 You should put a disclaimer in your posts and let folks know that there are Shimano reels worthy of your hands. In the Curado series, I'll take an E, I, K, DC over any reel on the market. I'll even take a G over many other reels on the market. Oh, trust me he’s not dumping on my parade, I still love it, but I do respect LMGs knowledge and opinions on reels, I have a Curado K on my cranking rod an I love that one too. I can’t fork out $250 on very many reels but it is fun to have a few. Once they’re around for awhile and the price drops some, I may very well get some more if this one holds up. I dont put censorship in my posts. Very nice! I have been watching some of the video reviews on them, they sound awesome. I think any advancement in reel tech along with bringing the price closer to the weekend warrior budget is a good thing. I got my wife a Tatula TWSV so she could learn with fewer backlashes. I am going to try and pick up one of these for myself! Well, I'll tell you this, for what it's worth. I've seen the insides of just about every reel made in the last 15 years at least, many many times over. I personally own 18 pristine quality Curado E reels with Metanium bearings in them and carbon fiber washers. I love those reels but for the first time I'm very seriously considering selling them all and buying a bunch of DC Curados. I don't see anything I don't like about them. Be proud of yours. I bet that within a year, there will be some better deals from Ebay dealers on new DC Curados. Find one with a good rep and you will be able to save a few bucks. The only other reel I would consider is a zillion, but I would have to do some upgrades to it right out of the box and I think they are just priced a little higher than they would be worth to me. WOW Kevin, That is a pretty stout vote of confidence for the Curado DC. What are you seeing in this reel that has caused you to issue such a stellar vote of support? I kinda want to try one but I probably won’t. My thumb is trained. And if a DC reel doesn’t do its job one time after I got used to it I’d probably have the worst backlash ever. Might buy my Dad one for Christmas though. He’s the king of backlashes. Some reels are better than others. If I like something, it doesn't matter what someone else thinks or says. To each his own. The bottom line is if you like it, go with it. there ya go. If you like the reel then that is all that counts. I feel the same about my TAT SVTW reels they work for me and I really don't care if someone else does not like them. I like em and I pay the bills so I guess I get my way. Bud one must wonder what the Mrs has to say about you getting your way. That is one sharp lookin reel! I'd like to be able to cast the kind of distances folks are reporting with those. I think I'll just watch from a distance on those DC reels though... I put way too much time in learning thumb control to let the reel do the thinkin. I just want that green handle! Yeah. I want one for my Curado50E. Monkey control tactic Just yesterday I was going through some gear, and figured I'd like to add a couple more rod/reel combos... thought to myself "self, you only ever take 3 or 4 on the kayak... ya don't need any more"... I just figured I think too much and started cruising the Dobyn's site.